Mexico City (AFP) - Mexican drug baron Joaquin "El Chapo" Guzman's powerful Sinaloa cartel will likely survive his extradition to the United States, but a well-armed rival gang could intensify a war to seize his empire. Analysts often compare the Sinaloa cartel -- with its multi-billion-dollar drug business spanning the globe -- to an international corporation strong enough to withstand the loss of its CEO. 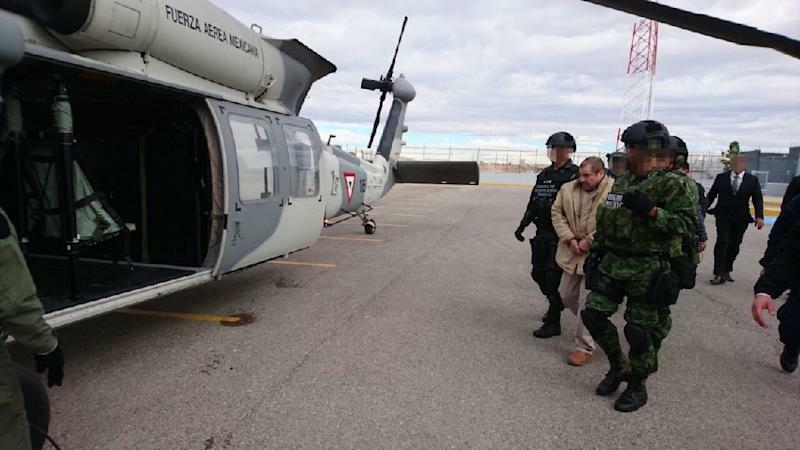 Thursday's extradition "is a great moral victory, but it's not going to have any impact on the Sinaloa cartel," Mike Vigil, a former senior US Drug Enforcement Administration (DEA) official, told AFP. During Guzman's three stints in prison -- he escaped twice and was recaptured last year -- the business has been headed by his longtime associate Ismael "El Mayo" Zambada, Vigil said. "It's a horizontal structure which operates very much like a global corporation, with subsidiaries that are semi-independent," he said. But Guzman's departure could open the door to two conflicts: an internal power struggle in the gang and an attempt by another cartel to seize on his extradition to grab territory. While Zambada is a respected figure within the cartel, its many factions could end up fighting each other, with Guzman's sons, his brother and other members possibly harboring their own ambitions. But the most immediate threat comes from the Jalisco New Generation drug cartel, a former ally of the Sinaloa organization that has grown into its own $50 billion powerhouse, according to a Mexican government estimate. The Jalisco cartel "will look at this (extradition) as a weakness for the Sinaloa cartel," Vigil said. "They may decide to go on an all-out offensive on the Sinaloa cartel now that Chapo is no longer in the country," he said. The New Generation's incursions into Sinaloa's territories led to a surge in murders in the US-Mexico border city of Tijuana and turned the tiny Pacific state of Colima into the region with the highest homicide rate, with 72 per 100,000 inhabitants last year. Led by Nemesio Oseguera, alias "El Mencho," the gang, which is also known by its Spanish initials CJNG, has launched bold attacks on the police and military. In March and April 2015, the cartel killed 20 police officers in two separate ambushes in the western state of Jalisco. In May of that year, the gang used a rocket-propelled grenade to down a military helicopter, killing seven soldiers and a policewoman. CJNG has forged ties with criminal organizations in the United States, Latin America, Africa, Europe and Asia, according to the US Treasury Department. A Mexican federal government official, who spoke on condition of anonymity because he is not authorized to speak publicly, told AFP that the Jalisco gang is already wealthier than Guzman's cartel. A government analysis estimates CJNG's fortune at $50 billion, compared to around $20 billion for Sinaloa, the official told AFP. "The Jalisco cartel will now dominate even more," the official said. "It's the richest (cartel). It has more areas of influence to export drugs" to other continents. One of Guzman's sons, Jesus Alfredo, was kidnapped by CJNG members in a restaurant in the Jalisco resort town of Puerto Vallarta in August. He was released days later and US officials told AFP that the abduction appeared to have been a decision taken by low-level members of the cartel, not its leadership. However brief, the kidnapping showed that the Sinaloa gang's most prominent members were vulnerable. But the Sinaloa cartel could be its own worst enemy if leaders of its various factions fight for control. Guzman's brother, Aureliano Guzman Loera, alias "El Guano," leads a faction that has been battling the Beltran Leyva drug cartel in Sinaloa's mountains, according to military officials. Authorities have also identified his sons, Jesus Alfredo and Ivan, as members of the cartel, accusing them of launching a deadly ambush that killed five soldiers last year. "If Chapo's extradition triggers ruptures within the cartel, this would certainly open a space for the Jalisco cartel," said Mexican security analyst Alejandro Hope. "This conflict (between the cartels) will continue," Hope said. "But it could accelerate with an internal conflict."